Remember how much fun it was to paint in kindergarten? Come splash around and play with watercolors! Basic techniques will be covered and then we will “ play with color “. No one will be asked to draw a straight line or stick person. Remember, it’s only paint. Basic supplies included. Space is limited! In spite of the Saturday brunch crowd, there is ample free parking behind the Kenwood Galleria. Bring your art supplies and create in community support. Self directed with individual coaching as needed. 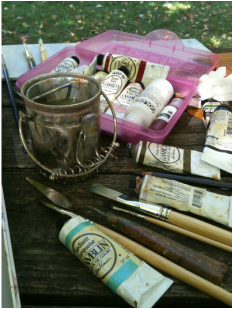 Marion can help you with oils, acrylics, watercolor or pastels. Storage space is available in the studio for your supplies and wet paintings. Come use your art stuff! Pre-registration is required for this workshop. Please email Marion if you plan to attend so she can plan for you! Pre-registration is required. You can order the class card by clicking the "Shop Now" button. Email Marion if you are interested! Bring your art supplies and create in community support. Self directed with individual coaching as needed. Storage space is available in the studio for your supplies and wet paintings. Come use your art stuff!